"Garbage Fund Bond - Great Falls, Montana - May 7, 1923." 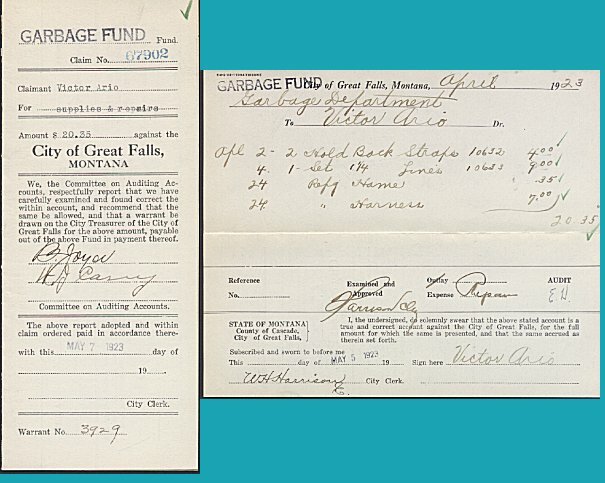 (1250) Garbage Fund Bond - Great Falls, Montana - May 7, 1923. - Condition: Excellent This wonderful Municipal Bond was designated for Great Falls Garbage Fund. The Claimant was Victor Ario and was signed by three members of the Auditing Accounts. Money went for a list of items including 2 Hold Back Straps, lines, harness etc. Price: $9.00 + Shipping.